High school graduation is an exciting time in a teenager's life. It is the culmination of twelve years of hard work, an avalanche of memories for both the student and parents, and a whirlwind of activity. Once the dust settles from all the events surrounding graduation, it is time to send thank you notes for the graduation gifts the teen has received. Use the sample text in these examples to create thank you notes. The best notes are personalized with the giver's name, a mention of what the gift was, and how you plan to use it. For example, if the gift was a new GPS, you might write: "I love my new GPS and plan to use it to find my way around when I attend Indiana University in the fall." Even the most generic note can be personalized when you mention a specific gift. I am so glad that you were able to come to my graduation. I wanted to thank you for your support of me throughout my high school years and for the wonderful gift card, which I plan to use toward the purchase of a mini fridge for my dorm room. Your thoughtfulness is greatly appreciated. I wouldn't be the person I am today if it weren't for your love and example. Although I greatly appreciate the graduation gift, the legacy you've given me of a loving family is worth more than all the laptop computers in the world. As I head off to Harvard University in the fall, I am going to miss you greatly. However, I take with me the lessons you've taught me over the last 18 years. I love you and plan to make you proud. I appreciate the Visa gift card you gave me at my open house last weekend. I plan to use the gift card toward some of the essentials I need for my dorm room, such as a bedspread, sheets and a trash can. While I am away at Old Miss, I will think of you fondly every time I use these items. I am thankful that you took the time to think of me and to come to my open house. I have enjoyed having you as neighbors for the last ten years and thank you for not telling my parents that time that I left your hose on when I was little. Ha ha! I hope to see you when I'm home on breaks and holidays. I loved your gift of stationary. This will come in handy for writing while I am away at college. Your thoughtfulness is greatly appreciated. All through my life, you've known the exact gift I need, even when I didn't know I needed it. Well, you've done it again. Your graduation gift of that crazy zebra-striped rug was exactly what I needed for my dorm room. I can't wait to get to school and decorate my room with it. I'm sure I'll be the envy of the entire floor, not to mention that in the winter I will be thrilled to have something soft and warm to put my feet on when I get out of bed in the mornings. Aunt Virginia, I am going to miss you so much! Your advice helped me stay sane through my teen years. I know you're only a phone call away, but it just won't be the same. I love you very much. Thank you, not only for the gift, but all your help with the graduation party and getting me through my teen years. There are times when a person doesn't give you an actual gift or monetary reward, but you still want to thank them for their support. One example would be a best friend who is also graduating. You might not exchange gifts, but you still want to mark their presence at your party or other help they've provided. The sample below is one way to thank this person. I am so thrilled to have you as my friend. I know we agreed not to exchange gifts since we were both graduating, but I want to thank you anyway. You came to my house and spent six hours helping me and my mom put together snacks and decorations for my open house. That was one of the best gifts anyone could give me. Having you as a friend means more than any computer, money or other gift that I could ever receive. I can't wait until we get to room together in the fall. 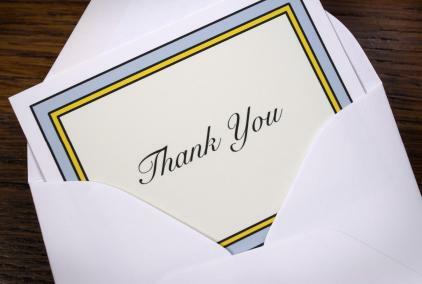 According to Forbes, there are only two rules to thank you notes and that is that you write them and get them out promptly. Different etiquette experts recommend different time frames for getting the letters out. A good rule of thumb is to get them out within a week or two of receiving the gift. The Modern Manners Guy indicates that thank you notes should be handwritten. In this age of digital communication, a handwritten thank you note is unusual and will be noticed and appreciated by the recipient. However, if you are unable to send out a handwritten note through the mail, a text or e-mail thank you is better than no thank you at all.